David Cantor and Greg Shalom. April marks 30-year anniversary for Team Resources in the commercial & industrial real estate business. 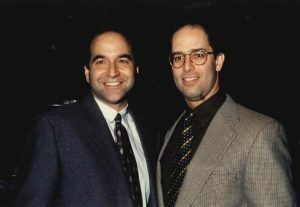 Award-winning full-service commercial/industrial real estate agency Team Resources Inc. began in 1989 by David Cantor and Greg Sholom during the heart of the real estate recession that followed the stock market crash of 1987. What began as a four-person operation has grown into a nearly 30-person company that brokers between four and five million square feet in a typical year. Team is now led by four principals including founders, Cantor and Sholom as well as, Joe Manganaro and Eric Lewin. With an experienced sales staff, Team Resources’ agents range from industry rookies to those with many decades of contacts and experience. Quite a few of the salespeople bring knowledge from other industries such as retail and wholesale operations, government and Wall Street. The brokers at Team Resources take pride in the amount of repeat business generated, the company said. In addition to market knowledge, it takes a great deal of people skills to succeed in the competitive and fast-paced environment of northern New Jersey commercial real estate, and the brokers at Team have repeatedly demonstrated not just the ability to find and match buyers with sellers, but also the tact to get deals closed. Notable customers over the years include: Volvo, Raymour & Flanigan Furniture, Coca Cola Co., Harley Davidson Motor Co., Samsung, New Jersey Transit, Giorgio Armani, Delonghi America, Goya Foods, Ralph Lauren-Polo, Century 21 Department Store, the US Department of Justice, Haddad Brands and Royal Wine/Kedem, just to name a few.